Home Articles NPC Preview: Four Contests This Weekend! NPC Preview: Four Contests This Weekend! The 2012 competition season is in full swing with four contests – including three national qualifiers – this Saturday across the country. On the West Coast, over 225 competitors are expected to turn out for the San Diego Championships in bodybuilding, physique, figure and bikini. In the Midwest, the Midwest Open will host some of the top bodybuilding, men’s physique, figure, fitness and bikini competitors in the region, while the Cincinnati Naturals will take center stage in Ohio. On the East Coast, Atlanta, Georgia will play host to the Atlantic USA Bodybuilding, Figure and Bikini Championships . 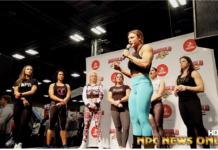 Check back on Monday for highlights from the weekend in the NPC! Previous articleOlympia Qualification Series Announced! Next articleSt. Louis Pro Check-In Candids!